Last week, I shared a dress with you from one of my new favorite shops - Mindy Mae's Market. This top is another item in their Instagram feed that constantly has me tempted. They were having one of their flash sales, so I decided to finally take the plunge. It really is the perfect berry color, and I like that the gingham pattern is a little bit larger than you often see, yet not super big - it's just right. Leopard most definitely pairs perfectly with pink, so I decided to take it one step further and pattern mix with this gingham top. I always love leaving you with extra ideas on how to style pieces, so here's a double header for you. Wearing this open over an easy tee with light denim and pink Chucks is a perfect weekend look. And I say this is a double header because I last showed you this pink tee here, so now you have two ways to style that also! How do you like wearing your gingham? 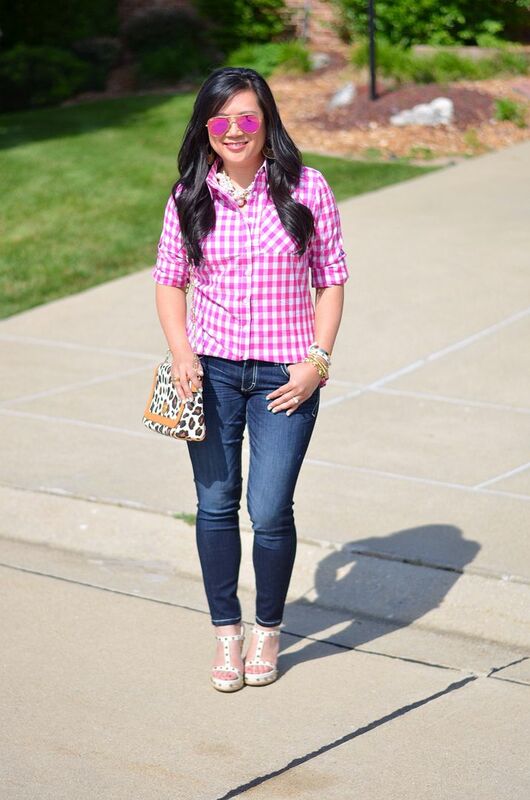 Such a cute gingham shirt! Perfect color for summer! What can i say? One word: PERFECT LOOK. I love the way you girl play with the colours. They're balanced and attractive. You look so feminine, beautiful and attractive. love this adorable outfit and these wedges are perfection. That gingham shirt is the cutest! This was on of our favorite layouts! 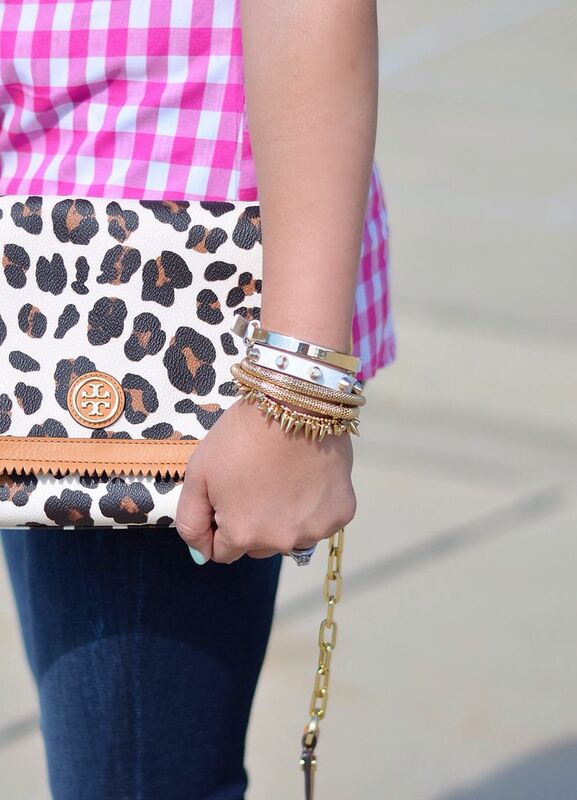 The heels and leopard purse are the perfect accessory! 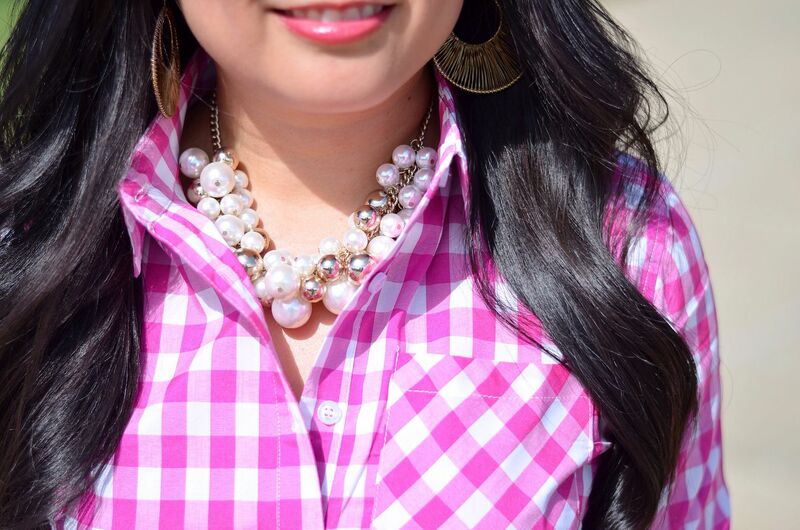 This is a double winner because you look amazing in pink and adorable in gingham. Good thing you did not resist this any longer! Oh my gosh love this! I know I told you this already but sreiously love your flat lays!! Love that shade of gingham!!! I am loving the gingham and leopard combo. I love the color of that shirt! 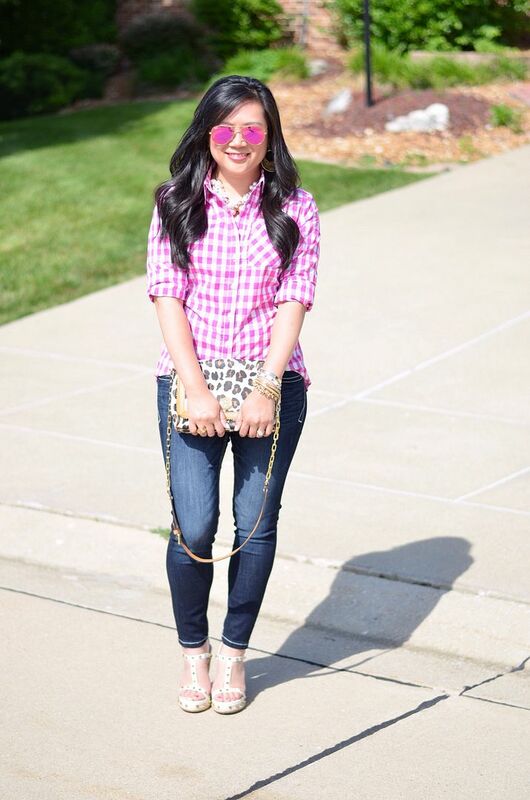 The gingham is so fun with the leopard and studs on your wedges! PINK! I love it all! Such a great look!